Great blue heron preening, shaped like a heart – babsjeheron. Great blue heron adults pair bonding during nest building – babsjeheron. It’s no secret that I love the Great Blue Herons you see here on this blog. There are some other photographers who also love the Herons they capture. To Judy and Phil and Jerry and Sylvia and Loukelier and Nick and Mike, “Here’s looking at you kid.” I love that you love your Heron models. Thanks to Ben H and WordPress for their recent WPC Challenge: Graceful. The courtship dance of the Great Blue Herons is often truly graceful. As the song quoted above says “…they whirl and they twirl and they tango…” and more. Great blue heron on the rocks. Is a Great Blue Heron a thing of beauty? And the shadow cast on the background here? If you answered “Yes” to any, would your opinion change if I told you the background is the shadow of a half-fallen chain-link fence? The rusty fence sags and droops out over the rocks and is a eye-sore in and of itself. But the shadow cast when the sun is over head? A thing of beauty. In the beginning she’d lobbied to name the turkeys, which I nixed, but I relented later when I saw what she had in mind. She christened them Mr. Thanksgiving, Mr. Dinner, Mr. Sausage, and—in a wild first-grade culinary stretch — Sushi. Long-time readers may remember posts about an apparently lovelorn young male Great Blue Heron coming of age and his ardent pursuit of an older female. On this day of cleanup in the cove, the young male had been intently watching the female from yards away down the cove, while the female poked the mud with her long beak, tugging persistently at something. Just as the young male made his move, strutting up the clove towards the female in his courtship posture, her beak lurched free from the mud, with a huge plastic bag stuck on her lower bill. I watched from my kayak hidden from their view in the trees along the shore, wondering if his ardor would be cooled by the plastic bag, or if he would try to wrest the trophy from her. She pivoted on her heels and flew westward out of the cove with the bag trailing from her beak, leaving the young male behind. I would be anthropomorphizing – something forbidden for field naturalists – were I to describe him as being dejected, of course. But then again, these are the only two wild creatures to whom I’ve given names. How much – or how little – do we know about the emotional lives of birds? And how do we know what we know? I’ve written here in the past about Tom Ricardi’s delightful presentation of Bald Eagles at our Nature Center, and this short video shows Tom with a 35 year old Golden Eagle, Turkey Vulture, Kestrel, Gyrfalcon and more. Windowpanes trembled with each percussive blow. There was no separation at all between lightning bolt and thunderclap. I huddled in the middle of the room, as far from windows as possible, waiting out the storm at ground zero. But it wasn’t ground zero at all. Photographer gets too close to a great blue heron nest while the nestlings are being fed by an adult. Close readers of this blog are aware of the protectiveness I feel towards the Great Blue Herons and their nesting places, especially the nesting island in the southernmost lake. I’ve written here about the fact that humans are among the most dangerous threats to the Herons. Over the years, I’ve fretted about too much boat traffic encircling the nesting island, concerned that the adult Herons would abandon the nest and their chicks. And I’ve watched as predators like Osprey and Red Tailed Hawks threatened them. Despite cautious monitoring of small craft and water skiers looping the island, despite watching with a lump in my throat as the predatory birds set their sights on the Heron chicks, at the end of the day, the nest was toppled by extreme winds. An act of Nature, not of Man. It was the Great Blue Herons’ nesting island – and not my home – that was at ground zero for the storm that night, and the tall tree supporting the Herons’ nest collapsed. And what of those four chicks in the photo at the top of this post? Had they fledged before the storm took out their nest? Surely that would be their only hope for survival. I returned to the lake every day I could after the storm, looking for survivors. I saw at least one of the fledgling chicks and one of the adult, parent Herons. My heart beamed elatedly. Those chicks are destined to be the last brood to fledge from our island. Fast forward one year, to September 2016. I had no idea where – or even IF – the Herons would breed again in that area. You may remember my story of the Bald Eagle stalking the Great Blue Fledglings one rainy day. That day, the Eagle was looking for lunch in all the wrong places. That day, I counted more Great Blue fledglings than I’d ever seen before in a single day. I’ve been looking for the new nesting spot, to no avail so far. That is a good thing. If I can’t find it, neither will the water skiers with their noisy motor boats. I love happy endings like that. Thanks to Ben H and WordPress for their recent WPC Challenge: Resilient. If surviving that fierce storm and coming back the following year with an even larger crop of fledglings is not a sign that the Great Blue Herons are resilient, I don’t know what is. Events like that storm and the survival of some of the Herons in the aftermath, and their successful breeding the following year are also increasing my own resilience, increasing my optimism for the future survival of the small community of Herons at the lake. 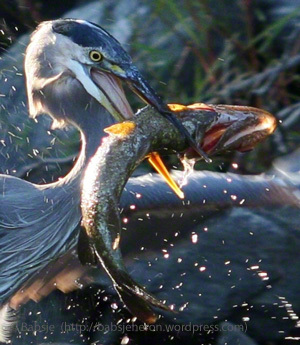 Each year there are new threats – especially from habitat destruction along the shoreline and in a few of the coves – but so far, each year, the Herons maintain their wing-hold at the lake. Thanks to Cherie Lucas Rowlands and WordPress for the recent WPC Challenge: Path. Some paths – like the boardwalk in a nature sanctuary – are concrete, well-defined, tangible things, easily seen even when nobody, or no thing, treads upon them. Others, like the migratory path of birds or butterflies are no less real, but difficult to see except when the creatures fly along them. The far end of this slender cove marks a point on the migratory path of these ducks. The Heron stood frozen in place as wave after wave of ducks noisily invaded. And thanks also to Cee for her recent Fun Foto Challenge: Duck Duck Goose Heron. Sorry, Cee, but I couldn’t resist taking a bit of liberty with your title. My Great Blue Heron photography has been featured in 3 one-woman shows at the Summer Street Gallery of The Natick Center for the Arts. In addition to the visual arts shown at the gallery, TCAN has a lively, dynamic lineup of upcoming performing artists. Thanks to Michelle W and WordPress for the recent WPC Challenge: Anticipation. I am anticipating Peace on Earth, Goodwill to All. Hopefully, sooner rather than later. And thanks also to Nancy T and WordPress for her recent WPC Challenge: Time of Year . It’s that time of the year when many express fond wishes of seasonal cheer. Count the Herons and me in as extending wishes of goodwill to all, and gratitude for the many sharings by others. Great blue heron blends in with rocks. Like a real-life Where’s Waldo? The patron in the Audubon gallery had browsed through the collection of Great Blue Heron photos, but kept returning to the one you see above. Finally, she came over to me and asked why I had included one without any Herons. We walked over to the wall together and I pointed out the Heron, his back perfectly camouflaged against the rocks. Had I cropped out the tell-tale burst of water drops that were flung upwards as the Heron thrust her head beneath the surface, the camouflage effect would be even more apparent. If you cover that burst of water in the photo with your hand, you can see how the Heron’s back fits in with the rocks. Great Blue Heron camouflaged in pickerel weed. The patch of pickerel weed along the shoreline in the photo above has been a perennial favorite. Can you find the Great Blue Heron there? Thanks to Jen H and WordPress for the recent WPC Challenge: Magic. Is camouflage magic? I say yes, emphatically.